Here’s a quick update of my progress with this female character since yesterday. I finalized the facial features tonight, and started working on the shading and textures. Here’s my current state of her. I’ve finished the eyes and textured them. I’ve also started paint the textures for the skin. There is still some more work left to do around the eyes and mouth, as I want some special things to go on there, but the base layer is in place. I’ve used the new skin node in LightWave 9.2 for the shading which I feed my painted textures into. I’m really enjoying all the new toys in LightWave 9.2. The next update will probably not be that far from my goal with this image. 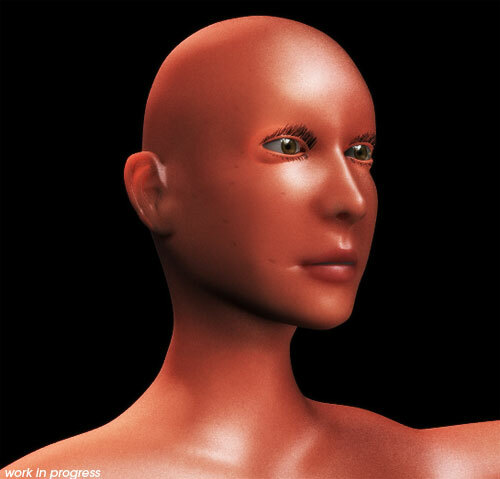 I’ll have the hair finished, the texure maps, clothing and the rig is also slowly getting in place for her posing. Stay tuned for a new update in a day or two.